We have new & used pallet racking and shelving at great prices. Storage & Handling Equipment, Inc.
All the industrial material handling solutions and warehouse equipment you need from industry-leading manufacturers. New and used industrial pallet racking in Clearwater Tampa Florida. 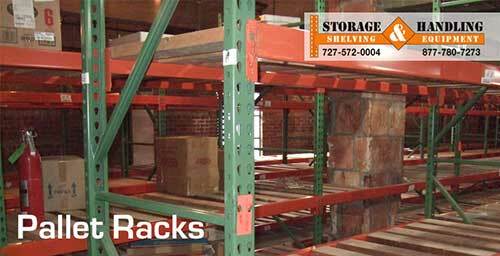 We provide warehouse storage racks. buying and selling industrial racking. Whether you need help choosing the right material handling equipment or already know exactly what you need, Storage & Handling Equipment can help. Since 1971, we’ve guided thousands of organizations just like yours to get more out of their existing space and/or optimize a new facility, by creating order, ease and efficiency. The end result? Improved productivity, increased safety and a healthier bottom line! We supply and install new and used quality warehouse racks and shelving throughout. Choose from Pallet Racks,Cantilever Racks, Mezzanines, Pallet Jacks, Carts, Bins and much more. 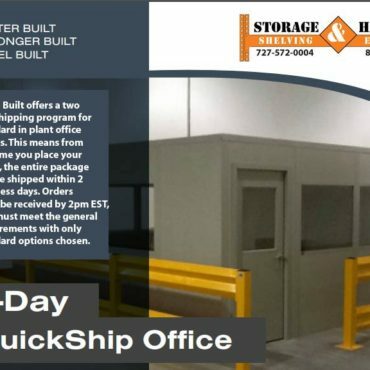 Large or a small business need to make every inch of space work, keeping materials and parts organized, and maintain a safe environment for employees and customers. Your industrial material handling solutions and storage systems should support your business goals, optimize your daily operations and give you fast access to everything you need. 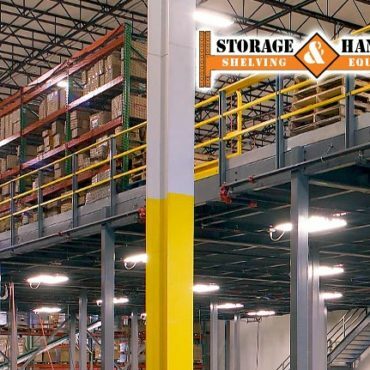 Every situation is unique and finding the right storage and warehouse equipment to make the most of your space requires specialized knowledge. We offer used pallet racking, used cantilever racks, and many other types of used industrial rack equipment. We buy and sell pallet racks, cantilever racks, flow racks, and stack racks throughout the South East United States. Buyers save significantly in comparison to new industrial rack prices. Storage & Handling Supply can help your company save money when buying or selling industrial racking. You owe it to yourself to consult with the experts to find the most productive and economical solution. Sturdy new and used warehouse equipment backed by personal attention and expert advice in Pinellas, Hillsborough, Pasco, Polk, Manatee and Sarasota counties and beyond. Our warehouse is located in Clearwater, FL but we serve clients in: Pallet Racking Tampa, Pallet Racking Clearwater, Pallet Racking St Pete, Pallet Rack Pinellas. We supply and install Pallet Racks,Cantilever Racks, Mezzanines, Pallet Jacks, Carts, Bins and much more.